Before we get into Prospect Theory (PT), here’s a little background on Expected Utility Theory (EUT). EUT discusses how a decision maker chooses between risky or uncertain prospects by comparing their expected utility values. The framing and process of choosing should be irrelevant; in other words, people should always come to the same choice no matter how it is asked. But, as we discussed last week, people are not rational beings, and while EUT describes how we should act, PT helps us understand how we actually act. a) 75% chance at winning $5000, 25% chance at winning nothing. b) 100% chance of winning $3000. a) 75% chance at losing $5,000, 25% chance at losing nothing. b) 100% chance of losing $3000. In the first situation, the majority of people chose option B, the sure win. The strange thing is that of the second group of people, the majority chose option A, taking on risk. According to EUT, people should value the gain of $5,000 (or $3,000) the same as a loss of the same amount. But they don’t, and that is how PT is relevant in our everyday choices. 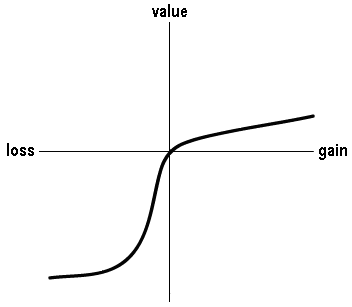 The graph to the right is the value function, an important part of PT. As you can see, losses are more pronounced, meaning that people value a loss as being more significant than they value a gain of the same amount. This is known as loss aversion, and is an anomaly along with the framing effect (which we discussed last week) and others that play a large role in PT. If you are interested in studying the Prospect Theory more in depth, feel free to read the original paper by Bykaheman and Tversky or check out this link.